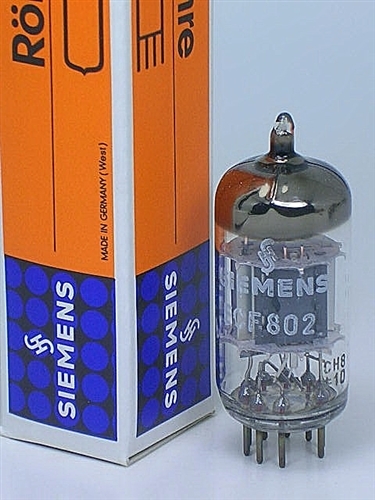 THIS TUBE IS RECOMMENDED FOR TUNER SECTIONS ONLY - NOT PREAMPS - FOR PREAMPS USE ECF82 (6U8) NOT ECF802. From the TubeMuseum Vaults: Please sit back, relax, and read about these extreemly rare ECF802 series made for critical sonic military to scientific medical applications in Germany in the late 1960's. One of the few ECF802's we see with a white delicate silkscreen, very rare and collectable rare coveted esoteric SIEMENS HALSKE tubes. 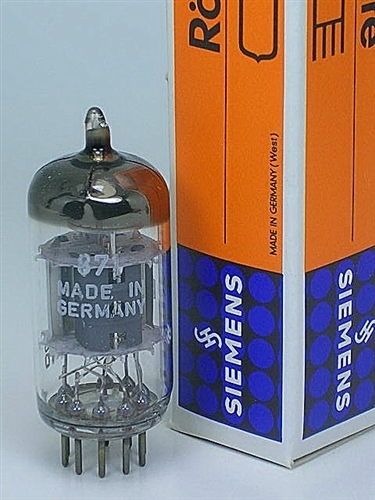 NOS PRISTINE MINT MUSEUM QUALITY RARE SIEMENS WEST GERMANY ECF802 RARE MUNICH TUBE Rarest SIEMENS HALSKE Germany 1961 Munich Production Upgrade your 6U8 "TUNER" APPLICATION to QUIET LOW NOISE SIEMENS ECF802! VINTAGE NOS 47 YEAR OLD TUBES! Proven substitute for Superior Performance in your McIntosh MR-67 and other tuners and amps that accept 6U8 / ECF82 / 6EA8 "...In reference to using ECF802 as a 6JW8 ECF82 / 6U8 / 6JW8 / 6GH8 substitute: "... ECF802 in comparison is almost the hyper version - everything turned to live and colorful, the improvement is so huge on my highly modified Scott 299D, which IS better than almost 99% of tube amps I have had and heard (very surprise here too consider the Scott is a product of many decades ago and versus these latest 4-5 digit "HI END" machines made today). My Scott is much like a fully waken up lion. This is a truly low noise, low mircophonics, and audiophile grade tube. 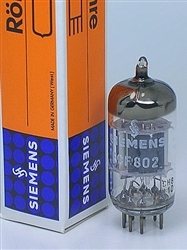 Although the tube is not rated exactly to the ECF82 and 6U8, but It can be USES for DIRECT SUBSTITUTE safely. What a shame to those who have these but don't know it could be used. These are also the best tube I ever tried on my beloved Scott, period...." -derst SIEMENS �‚ HALSKE Western Germany ALL TUBES ARE NOS NIB. These Siemens & Halske are the MOST SCARCE of the ECF802 construction for superior performance for 6U8 application performance Upgrades. "...I have been using ECF802 in place of my regular 6u8 in my McIntosh MR-67 tuner for years now, and the vast improvement is immediatly noticable ..I would never go back! It's as if the MAC was really designed around these tubes but due to the factory closing & cease in production, and due many things not limited to the high cost production the 6U8 was reluctantly substituted. All I know is that when I swap back and forth with the ECF802 to the 6U8, as the manual calls for, the increased improvement and "scary" performance of the ECF802 is the compelling reason why I will not use any thing else but these..." Proven substitute for Superior Performance in your McIntosh MR-67 and other tuners and SONIC preamps that accept 6U8 ECF82 or 6GH8A - SUPER-QUIET LONG-LIFE UPGRADE for 6U8 AND 6GH8A PROFESSIONAL AUDIO APPLICATIONS Note: Box displayed for historic representation and NOT INCLUDED in sale price.